Perhaps the most recognized medieval object from Hungary is the Holy Crown of Hungary, commonly known as the Crown of Saint Stephen. King Saint Stephen, the first Hungarian king received a crown from the pope in the year 1000. The surviving crown dates from later in the 11th century, but throughout ther Middle Ages it was regarded as the Crown of Saint Stephen. The Crown consists of two pieces. The lower part is a Byzantine crown (corona Graeca), dating from the 1070s. Its enamel medalions indicate that it was a gift of Emperor Michael Doukas to the Byzantine princess Synadene, wife of the Hungarian King Géza I (1074-75). 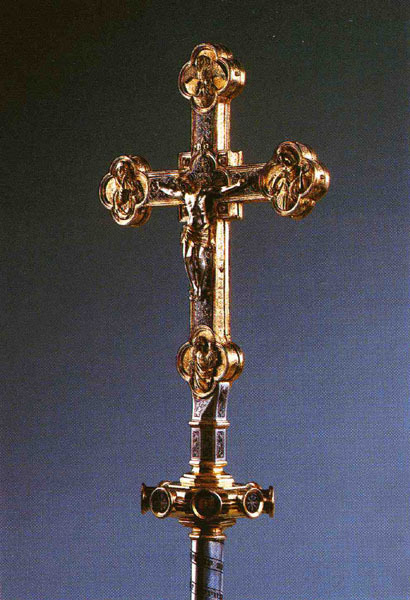 The upper part is cross-shaped, and originally probably had some other function. From its Latin inscriptions it is known as the Corona Latina. The two parts were joined into the present shape probably around 1200, at the time of King Béla III. The coronation jewels were seized by the US Army after WWII, an they were returned by President Jimmy Carter in 1978. To commemorate this, a replica of the Crown is shown at the Jimmy Carter Library & Museum in Atlanta. 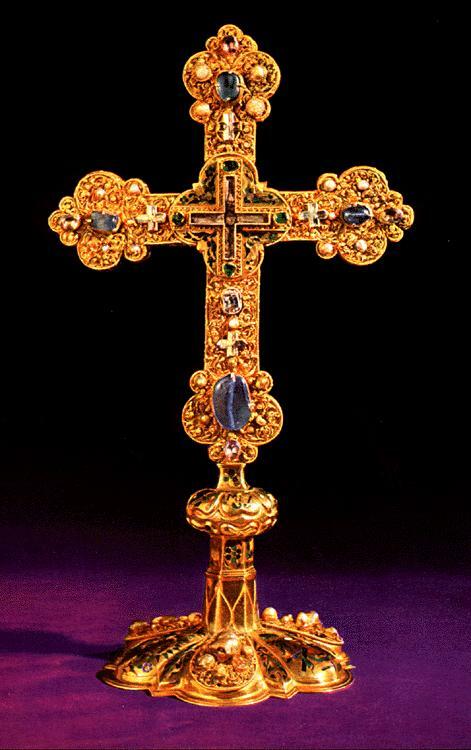 The Coronation Sceptre, an 11th century object, which includes a 10th century rock crystal. The Coronation orb, the simplest part of the ensemble, a fourteenth-century replacement of the original orb. The Coronation mantle, dating from 1031. The Coronation sword, a 16th century replacement of the original sword. A number of additional objects associated with the coronation ritual also survived in the Cathedral Treasury at Esztergom. 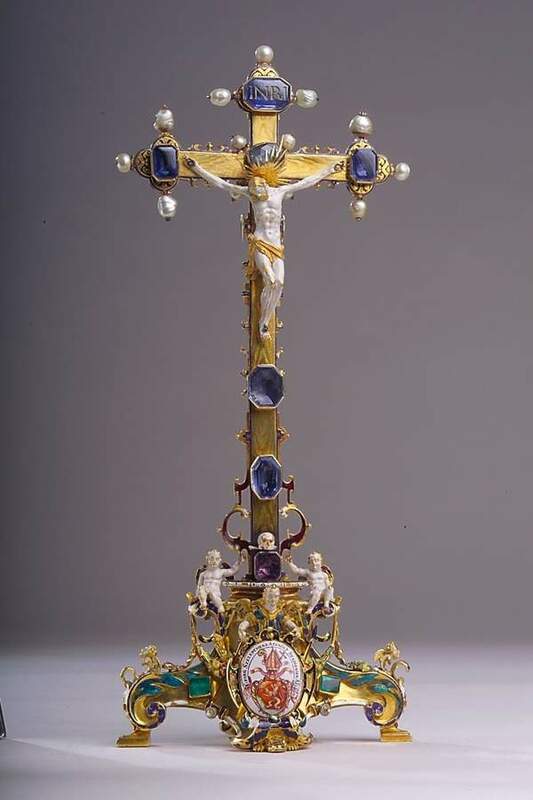 These include the 13th century Cross of the Coronation Oath (1), used in this capacity at least since the 17th century; the 15th century Apostolic Cross (2); and the 17th century Cross used for the kissing of the cross at the beginning of the ceremony (3). Also surviving are the coronation mitre and the coronation chasuble, see here. The silk gloves and slippers used during coronations got damaged beyond repair when the coronation regalia were hidden near Orsova after the fall of Hungary's War of Independence in 1849. -An illustrated overview of the Hungarian Coronation insignia, with photographs by Károly Szelényi. Essential resource! -Helene Kottaner's eyewitness account about the theft of crown in 1440 -overview in English, full text in German and in Hungarian. -US Embassy in Budapest and the Jimmy Carter Library on the return of the crown. Cecily J. Hilsdale, "The Social Life of the Byzantine Gift: The Royal Crown of Hungary Re-Invented," Art History 31 (2008), 602-631, available online. Katalin Kadar, Lynn, "The Return of the Crown of St. Stephen and its Subsequent Impact on the Carter Administration", East European Quarterly, 34 (2000), 181-202 (available online at www.questia.com). The coronation mantle of the Hungarian kings, by Zsuzsa Lovag et. al. Budapest, Hungarian National Museum, 2005 - English-language edition of a 2002 book, published after the restoration of the mantle. Tóth, Endre - Szelényi, Károly, The Holy Crown of Hungary - Kings and Coronations.Budapest: Kossuth, 1999. - This beautifully illustrated book is also available in German and Hungarian. Éva Kovács - Zsuzsa Lovag,The Hungarian Crown and Other Regalia, Budapest: Corvina, 1980, 1988. Insignia Regni Hungariae I. Studien zur Machtsymbolik des mittelalterlichen Ungarns. Budapest, 1983. Deér, József, Die Heilige Krone Ungarns, Wien, 1966. Bárány-Oberschall, Magda, Die Sankt Stephans-Krone und des Königreiches Ungarn, Vienna and Munich, 1961. Éva Kovács, "Casula Sancti Stephani Regis," Acta Historiae Artium V (1958), 181-221. Kelleher, P.J., The Holy Crown of Hungary, Rome, 1951. Révay, Péter. De Sacrae Coronae Regni Hungariae ortu, virtute, vicoria, fortuna, annos ultra DC clarissima brevis Commentarius Petri de Revva comitis comitatus de Turocz. Augusta Vindelicorum, 1613. The memoirs of Helene Kottanner (1439-1440), translated from the German with introduction, interpretative essay and notes / Maya Bijvoet Williamson., Cambridge [England]; Rochester, NY: D.S. Brewer, 1998. - Describes the theft of the crown in 1440. The so called Monomachos-crown, a Byzantine crown dating from the mid-11th century (Hungarian National Museum). See this recent article: Timothy Dawson, "The Monomachos Crown: Towards a Resolution," BYZANTINA ΣΥΜΜΕΙΚΤΑ 19 (2009) 183-193. 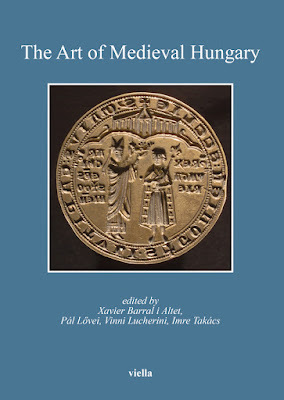 For more information, look at the catalogue entry from the catalogue Thousand Years of Hungarian Christianity. Crown found in the shrine of Saint Simeon in Zara (Zadar), probably donated by King Louis the Great or Queen Mary in the late 14th century.